After a successful première of Triglav The Rock Ljubljana, this year’s event attracted an all-star line-up both in the men’s and women’s competitions. World’s best climbers have already confirmed their participation, including Jernej Kruder and Janja Garnbret, who have been in top form so far this season. Kruder reached the podium twice this season, while other confirmed competitors in the men’s competition are Chon Jongwon, Alexey Rubtsov, Jan Hojer, David Firnenburg, Manuel Cornu, Rolands Rugens, Mickael Mawem and qualifiers who will try to qualify for the high wall in the centre of Ljubljana through Friday’s qualification round, taking place at the Plus Climbing centre in Koper. Climbers reaching the age of 15 in 2018 can register for the qualification round. The women’s competition will feature two Slovenians: last year’s winner Janja Garnbret and talented Katja Kadić. 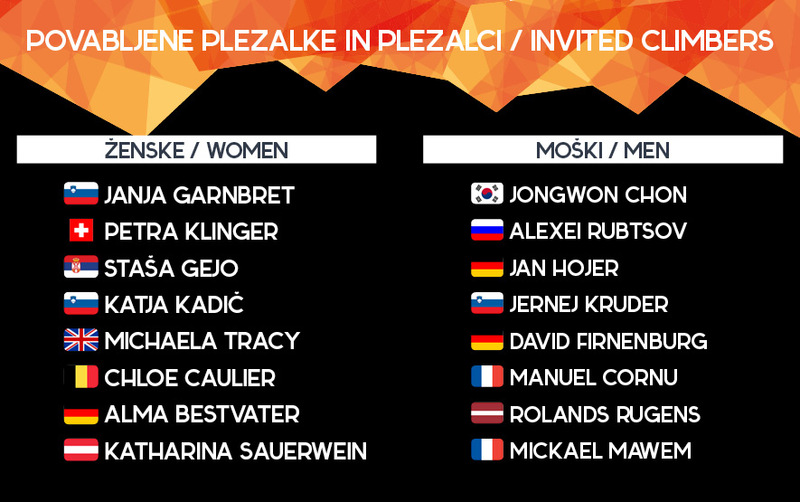 They will compete against Petra Klingler, Staša Gejo, Michaela Tracy, Chloe Caulier, Alma Bestvater and qualifiers. Top six climbers from the men’s and women’s competition will qualify for the grand final starting at 8 p.m.